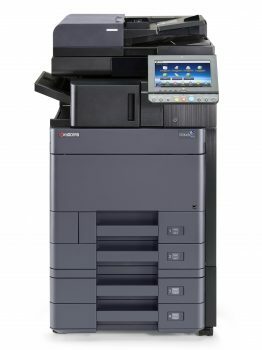 TASKalfa 4002i/5002i/6002: Kyocera’s TASKalfa 4002i, 5002i and 6002i take flexibility and performance to new heights. These versatile and powerful black and white MFP’s are instrumental in managing information across your entire enterprise. The powerful platform enables users to quickly and efficiently produce hard copy documents and digital files with extremely fast throughput and scanning speeds. To further automate workflow, these MFP’s can be equipped with added paper capacity and finishing for maximum productivity and minimum job turnaround time. The additional integrated business applications can further enhance capabilities and keep information moving at the speed of your business. Kyocera’s award-winning ultra-reliability and unique long-life technology ensure the superior performance and proven productivity your busy enterprise requires to keep it up and running at maximum efficiency. When it comes to document imaging innovation and quality you can count on, these models deliver.